This soothing and uplifting eye gel containing arnica and orange flower water is sure to give friends a laugh with its quirky name and packaging. Visit very.co.uk to take advantage of the 3 for 2 offer they currently have on the Anatomicals gift sets. This sweetly spiced bubble bar contains dried ginger, ground rhizome, distilled citrus oils and hints of blackcurrant to stimulate, warm and cleanse the body as you soak, oh and don’t worry, there’s not a witch in sight! This Soap & Glory best seller is great for the festive party season. Spritz on the sweet almond scented body gloss for a subtle glimmer and long lasting shimmer. For friends who have vowed to lay off the Christmas sweeties in a bid to avoid an expanding waistline to rival Santa’s then why not treat them to this delectable bath set instead? Featuring shower gel, bath salts, body cream, body scrub and soap all scented with our favourite Jelly Bean flavour fragrances. Now one of the reasons we all love Christmas is because it lets us release our inner child…so what could be better than a stocking filler that takes us back to the days of the penny sweet and tuck shops? 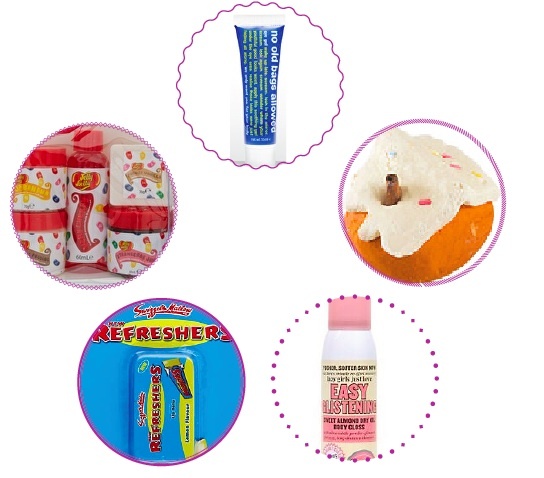 This Refreshers lip balm is the perfect stocking filler for old school friends and sweet tooth’s alike.